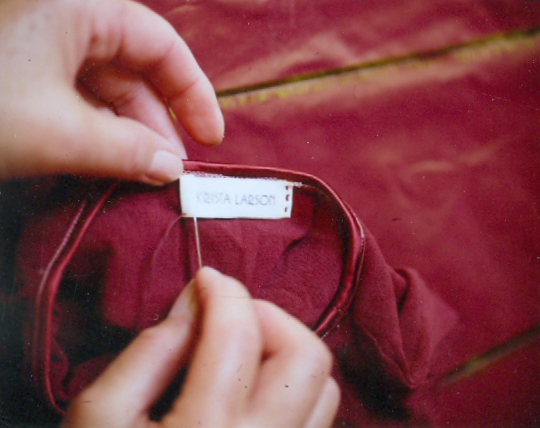 One of the many things that make Krista’s clothes so special, is that each garment is handmade. It passes through a variety of hands on its’ journey to your closet. From the initial sketches to the quality check before it gets shipped to the retail store, each item is touched and perfected on its way to you. This is the true meaning of “handmade” and it all begins in an old barn on the Exeter River in New Hampshire. 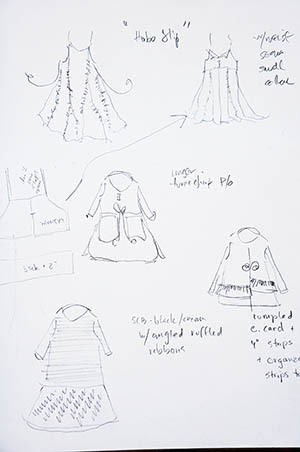 Beginning from the mind of the designer, Krista sketches out ideas and selects potential fabrics for the item. She then creates a pattern out of oak tag using a pencil and scissors. If the idea is really rough and she is uncertain how it will turn out she may choose to have the sample created in muslin first. If not, the fabric Krista originally picked will be cut using her pattern. 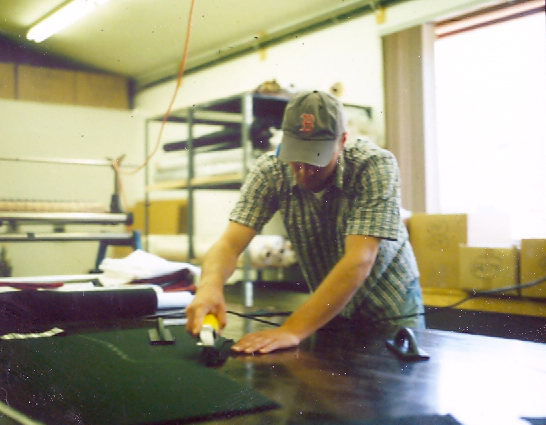 It all starts in the cutting department where the sample is handcut, usually just the one layer. 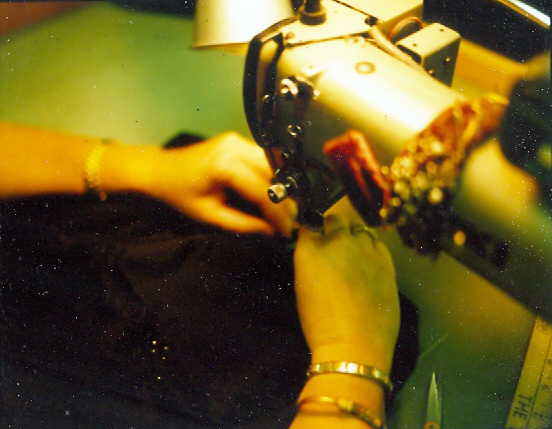 The garment then travels to the sewing department where Krista’s sample sewer Pam starts the sewing process (note-Pam is one of Krista’s models). If there is an unusual or distinct detail added, Krista will sew the sample herself. After sewing, it then travels to Lisa in Finishing where it is washed, trimmed, wrinkled, and/or dyed according to the design. Then the hand-sewers receive it for button and “Krista Larson” label application. Finally, it is checked for quality and adorned with a hang-tag (pictures of Krista’s dogs) and put with the other samples for the upcoming show (or bagged for store orders). 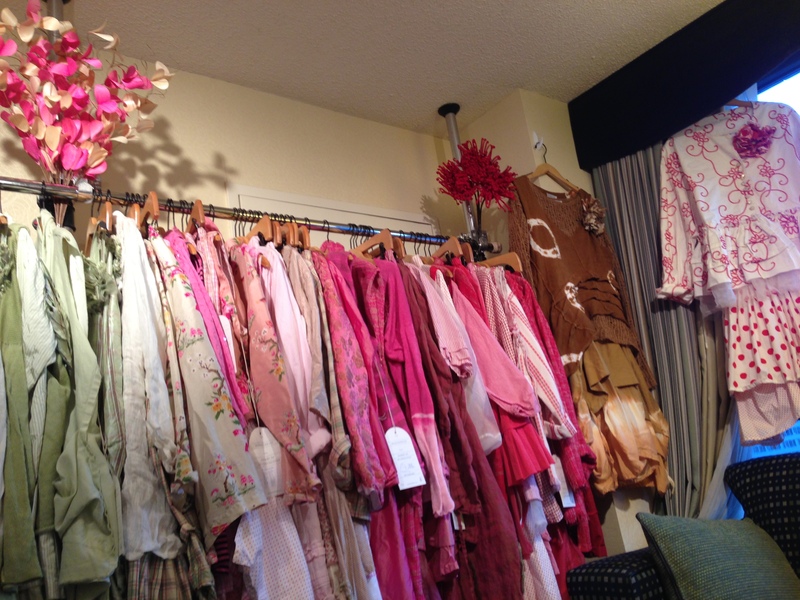 Storeowners then view and select items they would like to order with upwards of 40 fabric choices and a minimum 5 colors for each fabric. So many choices, that each order could end up being one-of-a-kind. They are reproduced for each store in the same process over the span of 3-4 months. At that point, UPS delivers the box of handmade garments to the retail store. With all of our heart, thank you for selecting these extraordinary handmade pieces – they are made especially for you. The process has such a personal touch- it’s amazing to see what goes on behind the scenes! Thank you for sharing!